From January to March 2008, the INM hosts the visiting research fellow Dr. Kazuhiro Matsumoto from the Hokkaido University, Sapporo, Japan. 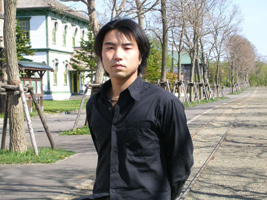 Dr. Matsumoto will join Dr. Hans Diebner's performative science research group. We gratefully acknowledge support of his residency through DAAD. Matsumoto's background is complex systems research. In his PhD, he applied nonlinear control stategies to engine systems. During his research residency he will work on models of interactivity. Performative interactions play a major role in many fields ranging from didactics to the arts. Performative science to a large extent rests upon interactivity as part of the methodology, too. Goal of the project is to narrow the gap between qualitative and quantitative research methods. Kazuhiro Matsumoto received his B. E. in 2003 from the Faculty of Engineering, Hokkaido University, Japan, after which he entered the Department of Mathematics, Graduate School of Science, Hokkaido University, and received his M. S. in 2005. Through the Ph. D. course, he studied applied mathematics and received his Ph. D. in Dec. 2007 with a doctoral thesis entitled "Controlling Engine System: A Low-Dimensional Dynamics in a Spark Ignition Engine of a Motorcycle", supervised by Prof. Ichiro Tsuda. Matsumoto is co-editor of the Japanese translation of "Chaos. An Introduction to Dynamical Systems" by Kathleen T. Alligood, Tim D. Sauer, and James A. York. - Kazuhiro Matsumoto, Hans H. Diebner, Ichiro Tsuda, and Yukiharu Hosoi: Application of Chaos Theory to Engine Systems. SAE International 2008. - Kazuhiro Matsumoto and Hans H. Diebner: A Simple But Efficient Method for Nonlinear Parameter Estimation Based on Comparing Phase Space Structures. Z. Naturforsch. A 61, 239-248 (2006).